Dr. Warren Farrell’s research clearly uncovered the reasons for the pay gap. H found 25 items women can do to in order to earn as much or even more then men. In many fields women can earn more then men. Women who decide to dedicate themselves to high earning careers can earn more then men, effectively inverting the pay gap. He may be sorry he asked. But during the years of research that followed, the answer evolved: Men earn more than women, but not for the same work—for 25 different workplace choices. Men’s choices lead to men earning more money; women’s choices lead to women having better lives. Men’s trade-offs include working more hours (women typically work more at home); taking more-hazardous assignments (cab-driving; construction; trucking); moving overseas or to an undesirable location on-demand (women’s greater family obligations inhibit this); and training for more-technical jobs with less people contact (e.g., engineering). Women’s choices appear more likely to involve a balance between work and the rest of life. Women are more likely to balance income with a desire for safety, fulfillment, potential for personal growth, flexibility and proximity-to-home. These lifestyle advantages lead to more people competing for these jobs and thus lower pay. Since men still earn more money, Why Men Earn More introduces to women the 25 ways to higher pay, showing which trade-offs lead to how much increase in pay, creating for women an opportunity to decide which trade-offs are worth it given her individual personality and current goals. women should stop trying to play off "victim power" and start wielding their true earning power. The Census Bureau did find that women earned 76 cents for every dollar paid to a male (now up to 80 cents on the dollar), but that was a raw number, not adjusted for comparable jobs and responsibility. 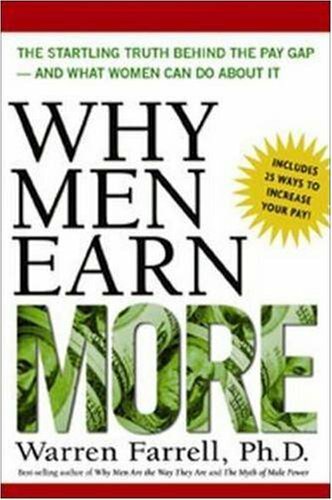 A new book, Why Men Earn More by Warren Farrell, goes further, examining a broad array of wage statistics. His conclusion: When reasonable adjustments are made, women earn just as much as men, and sometimes more. Some of Farrell’s findings: Women are 15 times as likely as men to become top executives in major corporations before the age of 40. Never-married, college-educated males who work full time make only 85 percent of what comparable women earn. Female pay exceeds male pay in more than 80 different fields, 39 of them large fields that offer good jobs, like financial analyst, engineering manager, sales engineer, statistician, surveying and mapping technicians, agricultural and food scientists, and aerospace engineer. A female investment banker’s starting salary is 116 percent of a male’s. Part-time female workers make $1.10 for every $1 earned by part-time males. Over 6 years ago, Warren Farrell debunked the pay gap myth and clearly explained all the reasons for income differences between men and women. Thus he gave all the means needed for women to not only close the pay gap but actually earn more and invert the pay gap. In all societies women have had bigger wealth. 4) Women inherit all at the end, because live longer. In my opinion, regardless of the amount of money, the person who is alive is wealthier than the person who is dead. Discussions with feminists and men’s rights showed that women want to earn the same as men without having to work as hard as men. Men must work hard and earn more, which is normal. However the concept of earning money is not perfect and less important in community’s perspective. The important thing is men must highly function and interact with the environment while women are staying at home and nurturing children. Yep, the reason men earn more than women is that they work harder. If women want to earn as much as men, they need to start working as hard as them.